Skin and Bones by Sherry Shahan delineates a sobering and startling look into the minds of teenagers with eating disorders. From the beginning we learn that svelte 16-year-old Jack Plumb, who weighs 103 pounds, is obsessed with his weight (in the most stunning ways): He wears only heavy, black sweats to force his body to perspire and rid itself of “liquid fat;” he relishes in the fact that every stomach growl means his body is consuming itself; and he fears the few ounces he’ll gain with every sip of water he takes. While these things may seem odd to you and me, they make perfect sense to an anorexic like Jack. But Jack knows he needs help because no one actually likes being sick. So he begrudgingly allows his parents to check him into a six-week program in the Eating Disorders Unit (EDU) at a rehab institution. And, of course, he hates it already. There are nurses watching his every move, bathroom doors must remain opened to ensure no one’s purging, and his roommate is…well…not what he expected. One of Lard’s first duties as in-house best friend and guide is to introduce Bones to the ins and outs of the program and “extracurriculars”. Lard shows Bones where they can unwind with herbal assistance, and even gets Bones a job in the cafeteria setting up and taking down tables and chairs (a sure-fire way to burn extra calories, Bones notes). Eventually, Lard helps Bones get acquainted with the rest of gang, which of course includes the teenage girls in the program. And there’s one in particular who stands out among the rest. Enter Alice, an anorexic ballet dancer who treats the EDU as a game of revolving doors. This time around, her frail body is working overtime, so she’s constantly attached to an IV bag and wheelchair and is being observed for potential heart failure. But all Bones sees is a breathtaking young woman with similar weight goals as his. She loves to break the rules, and encourages Bones to do the same time and time again. Her frail looks, seductive personality and warped body-image ideals are all attractive qualities to Bones, and he’ll do anything to prove his loyalty to her. Thus, we quickly learn that Bones and Alice are equally pros at beating the health-care system. They know all of the tricks: from sneaking in laxatives between the pages of a magazine to cheating at weigh-ins by sewing dinner knives into the bottom hems of hospital gowns. And they’re not only experts at staying thin, but at manipulating everyone around them, from family to friends to each other. So it’s fitting that Shahan describes her novel as a mashup between One Flew Over the Cuckoo’s Nest and Love Story, according to TeenLibrarianToolbox.com. But among all of their antics, family dramas and health issues, the two do form some kind of connection. The only issue is, are they consumed in romance for one another or their own chronic conditions? Somewhere along the way, Bones’s feelings for Alice develop into a desire to become a healthier version of himself. For Alice, it’s the exact opposite. Ultimately, can Bones save himself and Alice at the same time? Or will he fail at his quest altogether and revert back to his own destructive behavior, letting his family down and potentially threatening his own life? 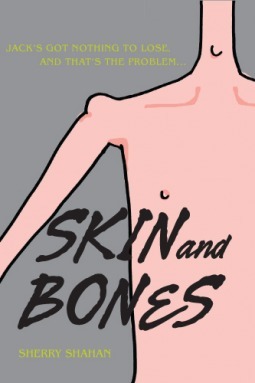 Skin and Bones challenges readers to reassess their own understanding of body image, personal health and wellbeing. It is staggering to read about the compulsive thoughts anorexics have every day and the lengths they go to not only remain thin, but to disappear altogether. While many of us have an idea of what an eating disorder looks like, you will truly see an entirely different side of it after reading this book. It’s disconcerting and rightfully offers a bleak realism that I only wish was shared more often with young readers. Recommendation: Highly recommended so teens can privately explore their body image with the understanding that everyone their own age wants to change something about themselves; provides an opportunity to discuss the same topic among family or friends without fear of judgment; Ages 13-18. Precautions: Adult language; minor sexual themes; some drug use; may trigger eating-disorder thoughts among recovering individuals; may inspire mentally unstable teens to experiment with the severe diet methods mentioned in the book. By omilaju in Boy Protagonist on January 31, 2015 .